With the rise of multiplexes we've seen all kinds of added extras bolted on to cinemas – coffee shops, pizza restaurants, bowling alleys, laser shoot-outs, art galleries – so why not virtual reality experiences? IMAX and Odeon are betting that a good number of you are going to want to enjoy some immersive VR goodness as well as (or instead of) a Hollywood blockbuster, and this week sees the opening of the first IMAX VR Experience Center in Europe, at the Intu Trafford Centre in Manchester, UK. The setup is very much the same as the Los Angeles centre we covered in February (this is now the fifth of these pilot centres worldwide): walk in and you're met with a series of pods, each with a different VR game or experience. Some are multiplayer, some are single player, and they're all powered by HTC Vives hooked up to gaming PCs, at least for the time being (IMAX says the technology will be regularly refreshed). The humming PCs are cleverly kept out of the way on a shelf above head level, which means your HTC Vive is attached via a pulley system above you, so there's no danger of tripping over wires. You can book a VR experience just like you would book a film – open up the Odeon website or app, choose a time, and say how many people you're going to bring along with you. Each pod is manned by a specialist assistant or two, ready to get you familiarised with the gear and the experience you're going to play, and to give you a hand if you're suddenly overcome with a wave of virtual reality-induced nausea. It's a little like the feeling of turning up with a stag party to play paintball in the way you get guided through the gear and the safety rules, and experiences will set you back between £7.50 and £10, lasting up to 15 minutes but sometimes less. A lot of this we already knew from the LA launch back in February, so what's changed? There's now more of an emphasis on interactivity and multiplayer, social experiences, says Giovanni Dolci, managing director for Europe and Africa at IMAX. The company is learning from the four centres already open in LA, New York City, Shanghai and Toronto, tweaking the formula to try and widen the appeal of these venues. Another change since February has been the increased use of props, like motion seats that sway and move with the action, to try and add value to the experience. IMAX shared a few statistics on the story so far: 50,000 people have been through the doors in the LA venue, for example, with 89% saying they would consider a return visit, though we weren't told how many actually did come back. Of those confirmed visitors, 35% had never tried VR before, and at the other end of the scale, 22% already owned a VR headset at home. Meanwhile 54% of those polled at the New York centre also watched a movie as well during the same visit (which means nearly half turned up for the VR alone), and the customer approval rating across the five centres open so far is 90%, according to IMAX. The running theme that Dolci and Odeon's Simon Soffe kept coming back to during the press day was that the role of these pilot centres is very much to test the waters. They're going to see what works and see what doesn't, and continue making changes, with five more pilot centres due to open up within the next 6-12 months in as-yet-undisclosed locations. Prices, types of experience, the gear being used, this is all flexible right now, and will keep altering from month to month. "The whole purpose of this is to pilot the concept and evolve, and try to understand how we should do things," Dolci told me. "We don't have a secret recipe that is going to work out of the box." The main plan right now is to make these VR centres stand out in two key ways. 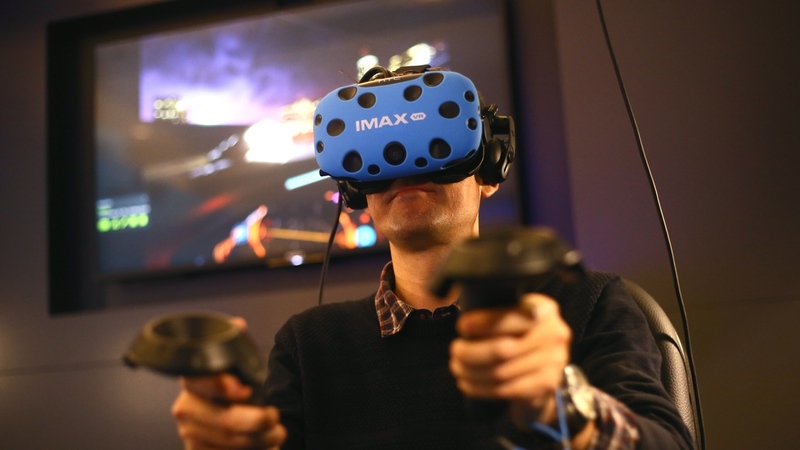 First there's the gear: IMAX and Odeon are keen to put together experiences that people can't get anywhere else, even if they have splashed out on an HTC Vive at home. With dedicated pods, space to move around in, a host of multiplayer options, and props like rumbling vests, this is a clean, top-end setup that you'd struggle to replicate in your garage or your spare room, even if you had the cash for it – and crucially, it's social too. Even better, the kit will be upgraded regularly, with firms like StarVR and Acer working with IMAX alongside HTC, so expect hardware besides the Vive to appear too further down the line. "The [IMAX VR] offering is not supposed to stand still, but is supposed to evolve as technology evolves," says Dolci. Second, there's the content: IMAX has set aside a fund specifically for developing exclusive VR experiences, so you can dive into apps and games that exist in partnership with your favourite movies and franchises. A lot of these IMAX-developed titles will be exclusive to VR centres before moving to other platforms, in the same way that movies can be seen first on the big screen before gradually dripping down to on-demand streaming services, and eventually the Christmas afternoon slot on terrestrial television. According to the team, you can expect to see around 25 titles made especially for IMAX VR appear across the next three years. I had a go at one of these titles, a brand new Justice League VR game intentionally developed for IMAX VR, where I got to drive and shoot as Batman for five minutes, and then fly and shoot as Superman for another five. It was polished enough to be fun, for sure, but there was still an 'extended demo' vibe that many a VR title exudes, almost like you're playing a preview. The controls were tricky to get to grips with (full disclosure: I'm not much of a gamer) and the objectives weren't all that clear either, beyond just zoom through space – though to be fair I haven't seen the accompanying movie, so perhaps that would've filled in some of the blanks. A much more impressive experience was to be had over in the Archangel pod, where I took charge of a huge mech warrior machine to blast away a variety of baddies. This is a fully realised game already available on SteamVR, and from the detailed graphics to the intuitive gameplay, it felt like a cut above the Justice League IMAX VR exclusive (the brief tutorial helped too). IMAX and its partners are going to have to work hard to make sure their exclusive content is as compelling as what's appearing elsewhere, though to be fair they're making the right noises about aiming to create "best-in-class" titles. "We want content that is exceptional and that is going to blow people away," says Dolci. "This is not dissimilar from what has happened in the cinema side of the business, where IMAX theatres have essentially established themselves as event platforms for the release of the world's best blockbusters." As long as the centres aren't relying solely on exclusive content, or solely on games borrowed from other platforms, they should be able to find a decent balance of really top-tier VR games and movie tie-ins. I also teamed up with a couple of fellow tech journos to try Star Trek: Bridge Crew "Rescue at Perseph". This was the most detailed and fully realised experience of the lot – it's adapted from an existing PSVR game – and I can see multiplayer games like this becoming some of the most popular IMAX VR experiences at these centres. None of us really had any idea what we were doing, but we all had specific roles on board the bridge of the Enterprise, and could communicate through our headsets: the sense of camaraderie made these ten minutes the most enjoyable of the whole day, even if the Klingons ended up running rings around us. And why Manchester? For those unfamiliar with the Trafford Centre, it's a huge shopping mall packed with hundreds of shops, restaurants and entertainment options, styled to look like some kind of ornate and glowing temple to retail therapy. Sitting right next to the Manchester M60 ring road, the site is one of the biggest and busiest shopping centres in Europe. It's also home to one of the biggest and busiest Odeon cinemas in Europe, placed right in the middle of the complex between an upmarket burger restaurant and a crazy golf course. The size of the audiences that this particular Odeon draws is one reason the Trafford Centre is a good fit for Europe's first IMAX VR Centre, but the other is the cross-section of people that pass through. The place is a day out in itself, whether you're after the cheapest fast food or the most expensive jewellery, and we suspect Odeon and IMAX will get a mix of punters here that they wouldn't get in the middle of London, or the middle of Birmingham, or even the middle of Manchester city centre. "It's a demographic that's quite interesting for us," Dolci told me, saying that while other locations might have resulted in a higher number of visitors, he's expecting better "real world" feedback from Manchester, feedback that will be a useful barometer as to consumers' appetite for having VR experience pods opening next to their multiplexes – or multiplexes built inside sprawling shopping centres anyway. The five pilot centres open so far all vary in terms of location and setup, deliberately so, and this is the first with a huge shopping complex attached. The IMAX VR Experience Center at the Intu Trafford Centre is open for business from Friday 24 November, and it sounds like IMAX and Odeon are just as eager to learn about people's reactions to VR and the social pod experience as they are to introduce audiences to the technology. Will these centres become the next must-visit experience for stag and hen dos? Can a family of five successfully defend the Starship Enterprise against hordes of onrushing Klingons in between their Christmas shopping? And just how many cinema goers can be persuaded to come for the movies and stay for the VR?